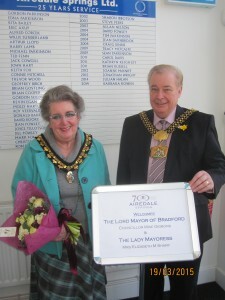 Airedale Springs were pleased to welcome The Lord Mayor of Bradford, Councillor Mike Gibbons and the Lady Mayoress, Mrs Elizabeth M Sharp on the 19th March. The Mayor and Mayoress were given a brief introduction to the Company and its history prior to a tour of our production facilities. 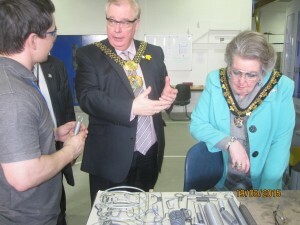 The Mayor and Mayoress were keen to learn about the programming skills required to set the different types of machines and the uses of the products made. The Mayor was interested to hear about the number of new products being made in Haworth which had previously been made in the far east. The visit concluded with the opening of a new production area for the manufacture of heavy compression springs. 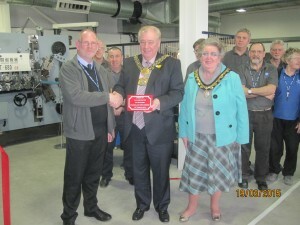 This facility was supported with finding from the LEP Regional Growth Fund (see link below) and has helped us expand our range of CNC Coiling equipment from 5.5mm diameter wire to 10.0mm diameter wire. In front of all our employees the Mayor complemented the Company on its efforts to rebuild the business and the clean and modern facility we now had. To commemorate the event a plaque was placed which had been manufactured using our 3D printing equipment. The Lady Mayoress was presented with a bouquet of flowers together with copies of our history book.